Hydraulic-press builders are focused on reducing energy consumption and providing finer control of speeds, positions and tonnages. Repeatability is the name of the game, and by leveraging the capabilities of state-of-the-art hydraulics and electronics, press manufacturers have become shining stars for their metalformer customers. Hydraulic presses, when generally not able to achieve the high cycling speeds of similarly sized mechanical presses, offer versatility thanks to variable stroke length, die space and pressure. 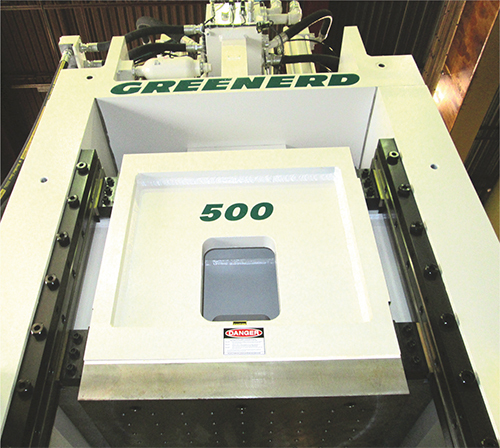 A conversation with Greenerd Press engineers Rob Bisbee and Tim Wilson directs the spotlight toward some of the behind-the-scenes technology that is raising the level of performance of hydraulic presses. Bisbee offers a great example. “I recently was programming a press with a very fast main-ram down speed of 1450 in./min. We needed to stop the hydraulic platen at a repeatable position of ±0.001 in. with each stroke, running the press at 10 strokes/min. Thanks to the unique capabilities of state-of-the-art PLCs and a very accurate and high-speed linear transducer, we were able to achieve that position-repeatability requirement. 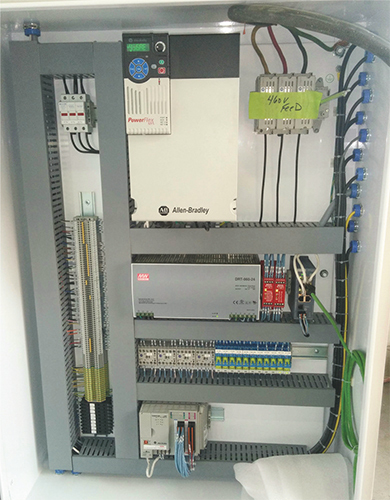 This electrical box, accompanying a recently installed hydraulic press, features a VFD (top center), fast PLC (bottom center), and an Ethernet linear-transducer cable—the green cable exiting the right side of the box. Hydraulic presses, when generally not able to achieve the high cycling speeds of similarly sized mechanical presses, offer versatility thanks to variable stroke length, die space and pressure. A hydraulic press often is the best choice for producing parts with deep, complex forms that require a lot of material flow, and parts that require a dwell at the bottom of the stroke. Modern electronic press controls provide accurate oversight of speed, position and force thanks to supervisory PLCs that receive input from linear and pressure transducers, load cells and programmable motion controllers. Finding more and more favor today, says Bisbee, are Ethernet linear transducers, with built-in Ethernet networking for error checking. Such improvements in electronic controls, as well as hydraulic components, have enhanced control and accuracy of slide velocity and tonnage during the working portion of the stroke. This improves part quality and avoids material thinning and other quality issues. A significant advance in the use of Ethernet as a control network came when control software evolved to allow programmers to seamlessly integrate the Ethernet-control components of the press line, says Bisbee. “A good example is a variable-frequency drive (VFD) that sits on Ethernet communications. With its hundreds of parameters to set, configure, read and write to, configuring a VFD can be a complex task. Now, though, thanks to software advances, it’s as easy as setting the initial Ethernet IP address, finding it with the PLC software and walking through a software Wizard to set all of the parameters. The 20-hp power unit (left) for a 300-ton press was designed with a pump that featured on-board electronics to control flow and pressure, minimizing the number of components and simplifying machine build and maintenance. The complete manifold (right) contains only a regenerative circuit, system relief and standard D08 directional valve. VFDs, which allow the use of AC drives rather than DC drives in large machines, offer several advantages when running hydraulic presses in production, which add up to significant energy savings for the metalformer. A VFD starts the motor when the press is ready to do work and turns off the motor when movement of the platen is not required. It allows the motor to run at slow speeds, or even remain off, during press idle times. And users can program the VFD to ramp the motor up, eliminating the large electrical inrush of current. Obviously, press performance rides on the performance of the hydraulic components as well—directional and proportional valves, the hydraulic oil and the pumps. First up for discussion with Greened Press’ hydraulics engineer Tim Wilson: the performance of modern directional valves. These units control the start, stop and direction of the hydraulic fluid throughout the press. “What’s new here,” says Wilson, “is a significant increase in flow from valves with the standard ISO pattern, avoiding the once-common use of added DIN cartridges to meet the needs of high-demand, high-pressure applications. Position repeatability of press components also receives a boost from newer proportional directional valves, now almost always provided with onboard electronics. With more responsive higher-frequency voice coils (to 400 Hz, vs. 10-Hz coils that were common a few years ago), valves with the electronic components onboard improve accuracy and repeatability, provide faster valve action and they’re not as prone to electrical noise interference, explains Wilson. Improved control of oil flow results in smoother press operation. And, for higher-speed presses, like those developed for hot forming, high-flow quick-acting proportional valves are a must. Pump control also has seen performance and cost improvements, due in large part to widespread use of onboard electronics, says Wilson. Previously, flow and pressure control typically were accomplished with controls ancillary to the pump. Now, pumps feature internal or manifold-mounted capabilities with internal controls.